Create and manage your tasks and to-do list using this add on. If a task is related to an individual property or contact you can quickly and easily assign it to the record in question. When viewing the record you’ll then see any associated tasks as the first thing on the page so you don’t miss anything. Open tasks will appear in the left column, and completed tasks will appear in the right column. Simply tick the checkbox when a task is complete and it will animate over to the completed column. Your to-do list is important and needs to be as visible as possible. 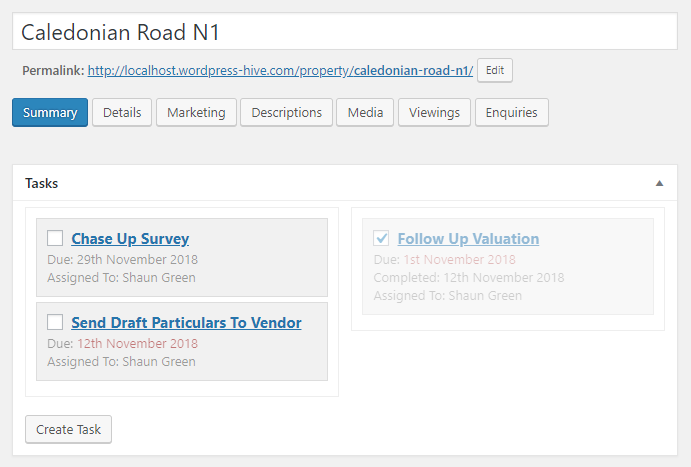 Therefore we’ve added a new dashboard widget showing open tasks assigned to you so you can see them as soon as you’ve logged in to WordPress. And of course there is the general ‘Tasks’ list available where you can view all tasks or add new ones. By default it will show open tasks assigned to you, but can be filtered to include completed tasks or tasks assigned to anyone.